These field days bring together a combination of taste-testers: farmers, students, and researchers. Tasters are presented with various varieties of different crops to assess the flavour, texture, smell and consistency and to determine their preferences. The most recent evaluation took place at Loes Research Station in Liquica district on 24 July. It was time to determine the delectable from the distasteful! The busy day saw 40 people including agricultural students from Universidade Oriental Timor Lorosa’e (UNITAL), three visiting agricultural undergraduate students from University of Sydney, as well as local community members, farmers and researchers. Laid out before them on a large table were 13 varieties of peanuts ready for tasting. Each participant was provided with water so periodic sips could cleanse the palate to ensure every peanut had its time to shine without flavour interference. At the conclusion of the testing participants were required to submit a completed survey and state their two top nut preferences. Overall, the MAF-SoL released variety, Utamua, reigned as favourite with 35.4% of tasters listing it as their top choice. Utamua is described as sweet and aromatic and has always proven to be the most palatable nut at each taste-test field day held across the nation. Three other varieties also ranked highly, presently only known by their code names, two originate from the same locale as Utamua, the International Crops Research Centre for the Semi-Arid Tropics (ICRISAT) in India, while the third is a local variety. Making certain all tastes are covered and all opinions heard, Crop Identification and Development Advisor, Rob Williams, explains the participants are a good sample as they come from across the country, “they’re representative farmers because they’ve come from all 13 districts to be here”. Peanuts, originating from South America and Asia were first introduced to Timor-Leste by Portuguese around 500 years ago. “Before the Portuguese arrived in Timor-Leste, there was no peanut here. 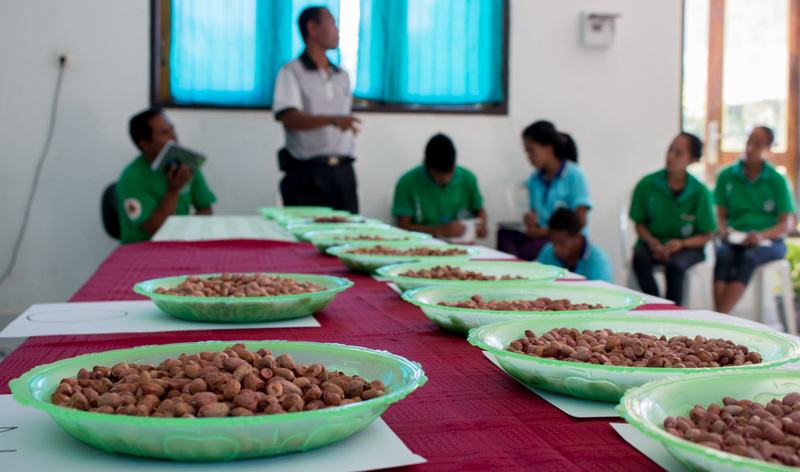 It wasn’t planted, because there was no seed”, explains Rob, “today, peanut is an important part of the Timorese diet and it’s vital to ensure MAF-SoL released varieties that conform with local tastes”. Jose da Costa Ronal Frygen, Researcher, based at Loes Research station explains Utamua originates from India and has been tested in five different research stations as well as in on-farm demonstration trials (OFDTs) during 2005 – 2007, “Utamua has a high production value and many people like to eat it,” he says.